What is Simple Adblock Notice? Adblock plus is a widely used browser extension which blocks advertisements which affects the blog revenue. 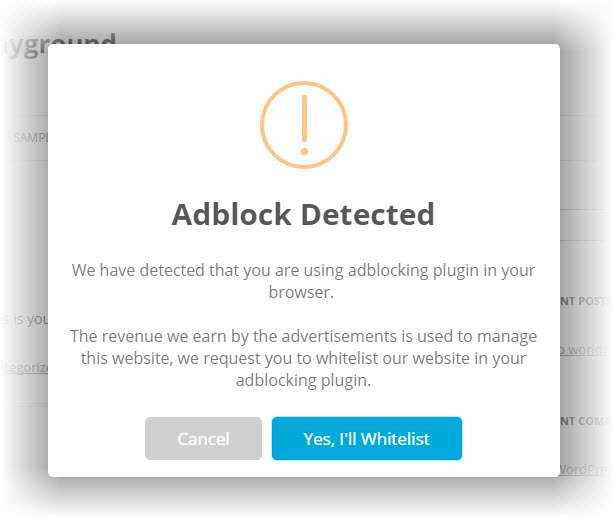 Simple Adblock Notice WordPress plugin shows a popup message to white list your website if it detects Adblock plus extension in your browser. It won’t repeatedly annoy the reader but it shows the message with interval set by you. You can choose the “Strict mode” to hide your entire website and you can also show a sticky notice always on the screen to annoy the viewer and make him/her whitelist your website. $5 – Get the PRO Version Now! Note: It is not recommended to activate this plugin when your website doesn’t have the advertisements.